For those that can remember seeing an colette x ASICS Gel Lyte III Sample last year around this time, it appears that colette and ASICS do indeed have an upcoming collaboration set to release in 2015. Unlike the pair we seen in 2014, this ASICS Gel Lyte III version comes decked out in the same Blue and White color scheme but ditches the marble look and adds a full polka dot theme covering the entire upper of the shoe. Constructed from an all over print leather with leather lining and woven labels. Underneath features an iced outsole with Colette logo, 3M reflective windows and Colette text printed on the heel counter. Each pair comes with three lace options. 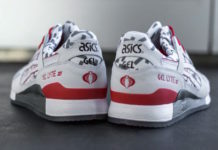 As of right now there is no confirmed stateside release date just yet, but here are a few detailed photos at the upcoming colette x ASICS Gel Lyte III “Dotty” collaboration. UPDATE: The colette x ASICS Gel Lyte III “Dotty” will release exclusively at colette and other overseas retailers like Hanon on June 27th. Stay tuned to Sneaker Bar for more updates on a global release.